Hey guys, my husband is at it again. He wanted a budget friendly beef wellington-esque sort of meal. 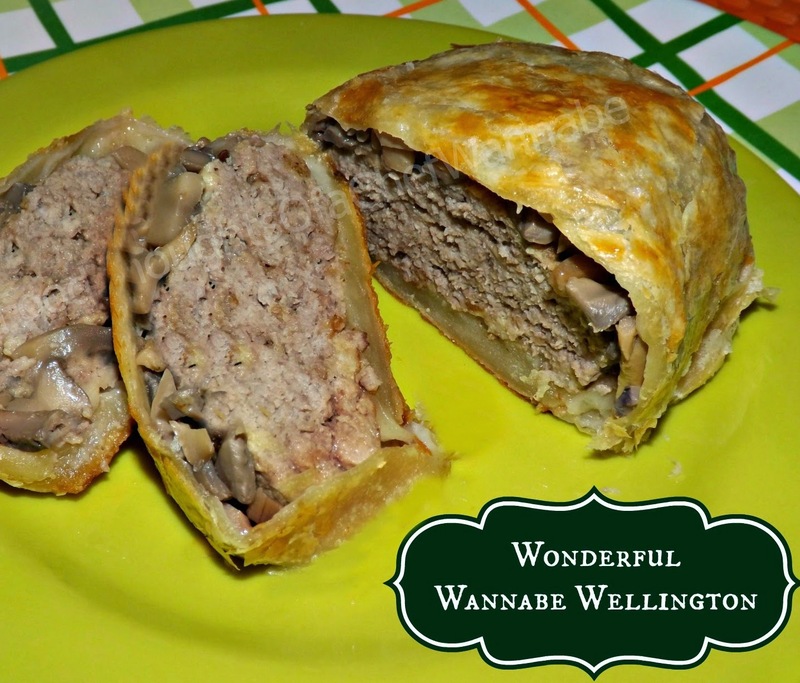 So we plotted and planned how we would replace traditional wellington ingredients with more budget friendly, more readily available ingredients. I am not exactly happy with how this photographed but you must just trust me when I tell you it was awesome. The flavor was full, the pastry was the perfect amount of crispy, and the beef was moist and done to perfection, not overcooked or dry. We decided to make the addition of a little beef gravy on the side and it was even better. I know the photo might not LOOK like it tasted awesome, but it did, and I am so thankful he thought of this and we went ahead to create it. This is fairly simple and quick, so I hope you enjoy it! My husband would love it if this a kitchen "hit", as HIS last idea is now my number 1 viewed recipe!! Here we go! Preheat your oven to 375 degrees. Line a baking sheet with foil and spray with nonstick cooking spray. Set aside. In a bowl prepare your meat mixture. Combine, ground beef, 1 egg, bread crumbs, salt, Dijon, onion powder, garlic powder, and pepper. Mix until all ingredients are combined. Form into 4 equal size patties and set aside. In a skillet, melt butter and add in mushrooms. Saute them for 2-3 minutes in a very hot pan, stirring the entire time. Remove into a bowl and then brown hamburger patties in 1 tbsp oil. Fry for 2 minutes on each side, until browned and cooked only slightly through. They will finish cooking in the oven! Take out 1 sheet of puff pastry. Using a rolling pin, lay it on a floured surface and roll over it a couple of times in each direction. Cut into 4 pieces. Lay out one square, add in 1/4 of the mushroom mixture to the middle, add a hamburger patty on top. Pull opposite corners together and then pinch the seams between. Carefully flip it over and place on baking sheet. Repeat with the other 3. Work quickly so your puff pastry stays as cold as possible. Keep it refrigerated as long as possible. When you are done brush the tops and sides with your beaten egg. It will help it brown beautifully!! Bake for 25-30 minutes. Let cool 5 minutes before serving. I served with some brown gravy. I think we threw tradition out the window and it tasted great!